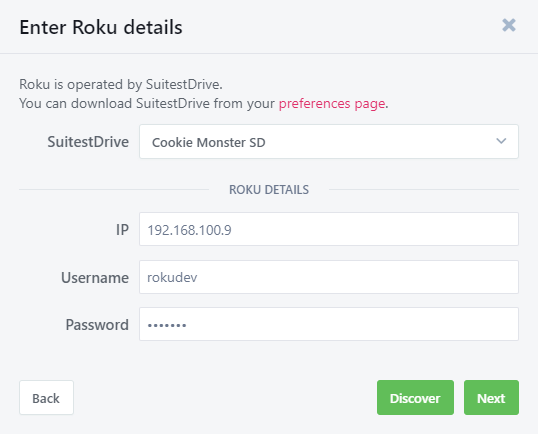 Suitest supports Roku devices running version 7.5 or later. 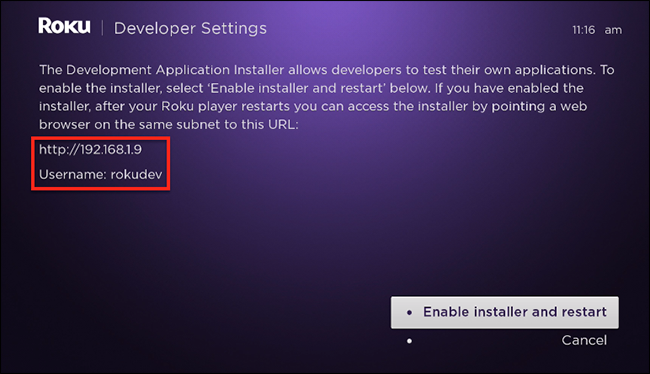 After setting up an Roku device you will be able to run automated end-to-end tests on Roku apps. Roku devices are operated by SuitestDrive. Before adding Roku device to your Suitest account, you need to pair your SuitestDrive with your Suitest organization. To add the device to Suitest a couple of settings in the devices system will have to be changed to prepare it for automation. To enable the developer mode on the Roku you will have to press a sequence of buttons on the Roku remote (not on the Roku mobile app). Take a note of the local IP address of the device and Username (rokudev is the default) that you see on the screen, you'll need it later. Then press OK on the Enable installer and restart button and follow the on-screen instructions to setup a password (you will need to input this password into Suitest later on). The Roku will now restart, once it's booted the developer mode will be activated. For Suitest to control the device, Network access must not be disabled. Press Home then navigate Settings > System > Advanced system settings > Control by mobile apps > Network access. In Network access make sure it is either set to Default or Permissive and not Disabled. Otherwise you will not be able to control the device via Suitest. To avoid Roku screensaver interrupting your Suitest test runs and authoring, completely disable the screensaver. Open the Device wizard, select Add physical device, choose Roku from the platform list and then press Next. Use the Discover button for Suitest to search your local network for Roku devices. First select the SuitestDrive that you wish to add the Roku device to. 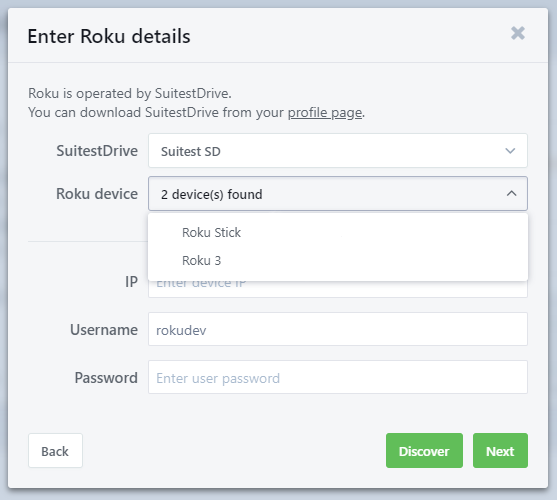 Press the Discover button, be patient while Suitest searches for Roku devices, if devices are found then you can select them from the drop-down. The local IP address will be automatically filled, however, you will still need to fill in the password and then press Next. Suitest will verify that it can connect to your device and download all necessary files for SuitestDrive, be patient this may take some time. No devices found: If no devices are found in the automatic discovery process, then you can try to add the device manually by filling in all the fields with the information that you previously wrote down (password, local IP address). Now that you have your Roku device configured, it's time to instrument your app and start testing. Please check the Roku troubleshooting section for guidance.